Takeaway: Rachel Bonkink's yoga journey is one that we could all stand to learn a thing or two from. Our Top Yoga Blogs directory is full of inspiring and original yogis, all sharing their love with us through their yoga journey. We thought they could use a bit of love from us, too, so we're featuring one of our top bloggers each month in a Q&A style. This month we interviewed Rachel Bonkink of Revealing Vajra. Here's what she had to say. About 10 years ago, while I was working very hard and climbing the corporate ladder as an operational director, somebody mentioned ‘yoga’ to me. I had a lot of stress at that time, working 24/7 and living a very fast paced life. And, yoga would supposedly be a way to get rid of the stress. I had no idea what that meant beforehand and in every single class I suffered. Being unfit, very inflexible, overweight and not feeling too well because I smoked my last cigarette at the gate of the venue and I was going cold turkey. But, I was intrigued, as I wasn’t thinking during the classes. I had not time to think as I was physically challenged and that took all my concentration. I was hooked on the spot, not to the practise of ashtanga in particular, but rather to the practise of being mindful in motion. Q: Why do you continue to do yoga? Yoga became a way of life that embraces asanas, meditation and the principles of the yoga philosophy. From my own practise and from teaching other people, I can see the immense benefits, subtle shifts and transformations that it brings to people’s lives. The practise of yoga in its broadest sense brings an awareness to my personal life that prevents me from just going through the motions. Yoga helps me in raising the standard of my life. How can I contribute more? Inspire more people to be a bit happier? How can I be even nicer to myself and to others? Q: Why do you blog about yoga? I blog about yoga because I’m grateful for the insights and inspiration that it has brought to my life. My aspiration is for lots of people to feel more happy, less anxious, more confident and relaxed and my blogs could be a first step for them in achieving just that. The great thing is that my blogs are read by people who have already found their way to the mat and people who have never done yoga before. Q: What’s unique about your blog? I bring a unique perspective because I have a strong corporate background so I really know what it is to have stress, to juggle with budgets and to be incredibly busy. On top of that, I love to get inputs from many different angles and share these. After my yin training with Paul Grilley last year for example, I went straight into a 3 Day Tony Robbins management seminar, which can be labeled as the exact opposite of anything yin. I find it fascinating how similar the messages were in both environments. Wrapped and packed very differently, but in the core, very alike. Every year, I go on several teacher trainings and (silent) retreats myself, to get different perspectives and ideas. Q: What is your most popular post and why? The post about the yogic principle of tapas or self-discipline and why willpower doesn’t work is the mostpopular one. It gives a brief explanation of the principle and practical advice on how to make lasting changes. I’m very excited about the book that I’m writing right now. It will focus even more on the yogic principles and how to very practically implement these ancient teachings into our modern day lives. If all goes well, it will be available in May 2019. Q: Do you have a favorite go-to pose? Why does it resonate with you? They give me a feeling of relaxation and ease. They are so simple and so beneficial on many aspects of the body, and mind. I love the stretching and stressing, releasing tension all over. Q: What has yoga brought to your life? Yoga has practically changed everything in my life, for the better. From my diet to my relationships, from my job to my body and mindset and even the country I live in. In my corporate years, I managed to completely neglect my body: drinking too much, not sleeping enough, flying around the world giving presentations, managing about a 100 people, having insane stress levels and responsibilities. When I compare that to my life today, well…, there is no comparison really. I just came back from running my first half marathon here in Marrakech, easily, without too much effort. I’m living by the beach, in Morocco and I work whenever I want. There is love in my life, I keep meeting the most amazing and inspiring people and above all, I enjoy life. 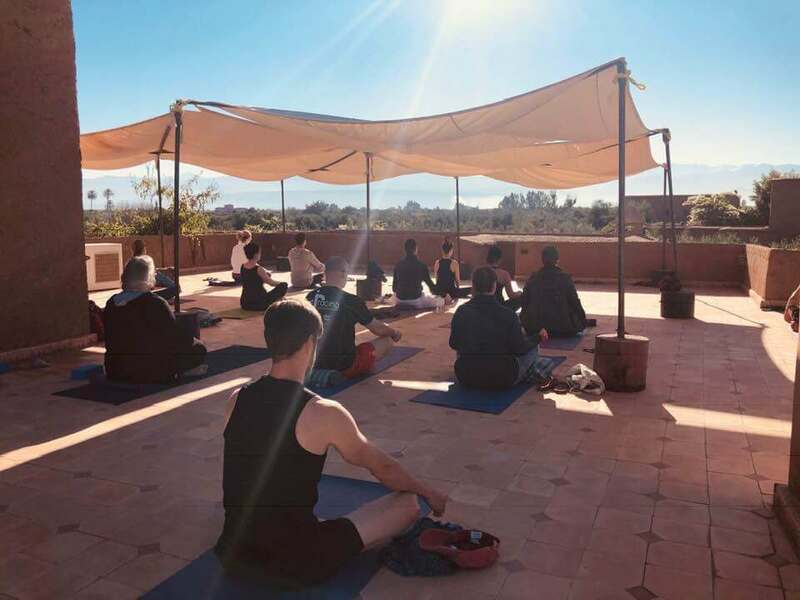 I own a successful yoga retreat business, where I’m hosting about 12-15 retreats per year anywhere in the world, from Morocco to Costa Rica and Scotland. And all of this, without a doubt, is the effect of having embraced yoga into my life. Q: What yoga lessons do you still consider a work in progress? The principle of ahimsa or non-violence can keep me busy for at least one lifetime. Some sources say that all the other principles are only there for us to practise ahimsa and that’s exactly how it feels to me as well. Active kindness when telling your truth or active kindness when seeing things that are very different than what you’re used to: not that easy. How about pushing through to reach your goals and being very nice to body and mind at the same time? Balancing on that fine line between experiencing pain and being uncomfortable has never been an issue in my asana practise, but for sure it has been and still is a challenge in my meditation practise. Q: If you had to give one tip about living the yoga life, what would it be? Show the world the real You, show us the perfectly imperfect and beautiful person that you are. One of the meanings of the word yoga is ‘union’ and more union, more connection is exactly what most people want. It is also the exact opposite of what they are achieving. The more walls we build up, the more that we refrain from showing our true Self, the less connections we build up as people don’t get to see who we really are. So, they also put up their masks and walls, opportunities and slots to connect are missed and we get nowhere. Instead, the attitude for us all could be: Hey, you look like fun, let’s connect, for real!